Animals silently walk through yards, parks and recreation areas. 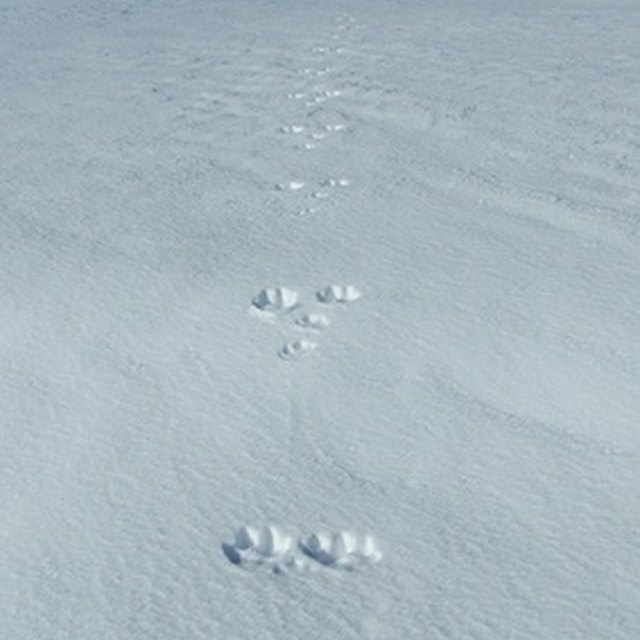 These prints or tracks can tell you which animal walked in that spot. In addition to the size and shape of footprints, study pattern in the tracks. Different animals move different ways. Follow these steps to identify the animal footprints you find. Count toes in the footprint. For instance, the raccoon track is distinctive because of the 5 long toes that look like fingers. The raccoon print resembles a child's handprint. Hind feet tracks are larger than those from the front feet. 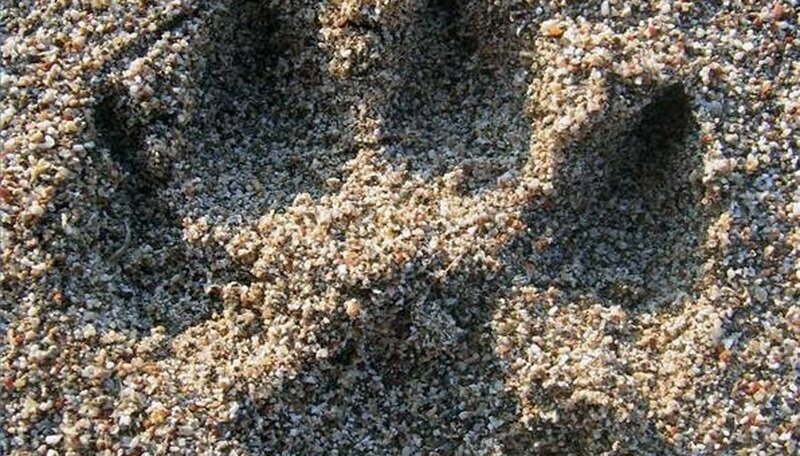 Check for claws in the footprint. Other five-toed animal prints come from the weasel family, which includes skunks. If you see 4 toes in the track, you probably found tracks from the cat, dog or rabbit family. Cats include mountain lions, bobcats and common house cats. Cats retract their claws when they walk, so you rarely see claws in a cat print. The biggest difference between cat footprints is the size. A house cat's print may be the size of a quarter. A bobcat's tracks are about 1-3/4 inches long, and the mountain lion's track is even larger. Look for larger front feet with 4 toes to identify members of the dog family. You may see small triangular marks in front of the footprint. These are claw marks shared by dogs, coyotes, foxes and wolves. Coyote and dog tracks resemble each other, but the coyote footprint is more oval. The gray wolf has a large, rounded footprint up to 6 inches in diameter. Discover a "Y" shaped pattern of movement that belongs to the rabbit. While rabbits also have 4 toes, they land with their hind feet ahead of the front feet and with one front foot in front of the other. Locate another hopper that lands with its front feet side-by-side. These interesting footprints with larger hind feet belong to the squirrel. The squirrel's hind feet land spread farther apart than the front feet. Another clue is the 5 toes belonging to the hind feet and 4 toes to the front feet. Other rodents (mice, chipmunks, woodchucks) present the same 4 toes in front and 5 toes in back. Detect larger hooved mammals by the presences of only 2 toes. Deer walk the same way as cats and dogs, but the print looks almost like a teardrop, coming to a point where the toes meet at the top. Adult deer footprints can be as long as 3-1/4 inches. Larger, rounder tracks belong to the elk. Huge 5-toed prints belong to a bear. With significantly larger back feet, a bear's tracks will zigzag and look like they came from a drunken animal. A good field guide is indispensable to the amateur animal tracker. Check out "A Field Guide to Animal Tracks" by Olaus J. Murie (Houghton-Mifflin, 1975). Start searching for animal footprints early in the morning before foot traffic cover any clear footprints. Contributor. "How to Identify Animal Foot Prints." Sciencing, https://sciencing.com/identify-animal-foot-prints-2083548.html. 24 April 2017.